The general settings of Custom Order Status for WooCommerce Pro plugin helps you to add custom statuses in different sections on the admin side, add default status for different payment methods, make the custom status orders editable and much more. Let us understand these settings in detail. 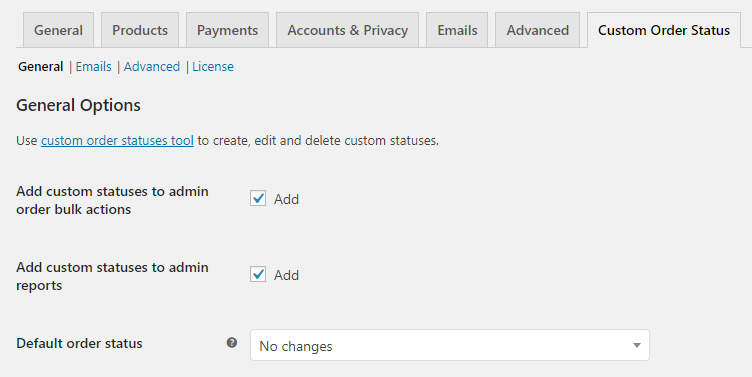 To go to the General Settings page, follow the path WooCommerce -> Settings -> Custom Order Status -> General. This page is divided into 2 parts, General Options and Reset Settings section. So when you want to perform bulk action on more than one order to change their statuses to Dispatched, select Change status to Dispatched option. When this option is ticked, the newly created custom order status will be considered while displaying the reports. This means Admin reports will consider all orders with custom order status and show the result and performance under Orders tab accordingly. So when you compare the display of results with and without enabling this option, you will notice that the details change. 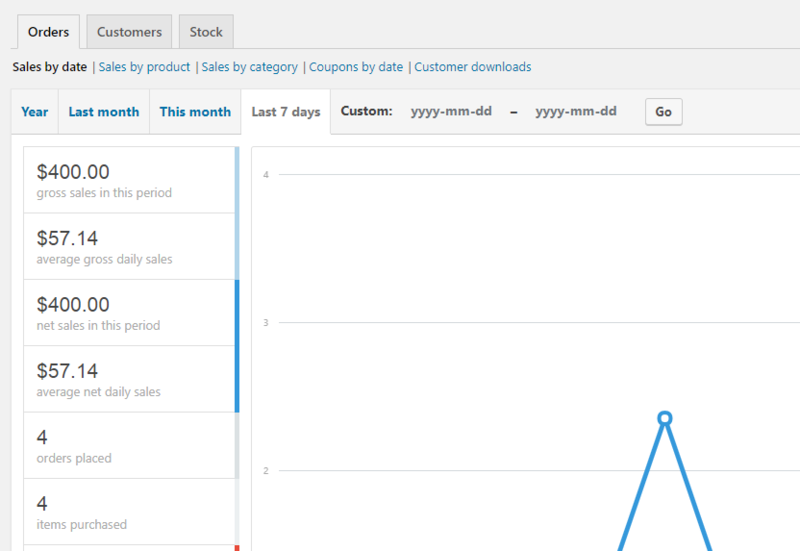 This option helps you to check the report for sales and orders including orders with custom statuses or without them. You can select a default order status for an order from the drop down. This drop down will include all the custom order statuses as well as shown below. Hence if you want, you can also opt to assign a custom status as a default order status to an order. Note – The selected default status may change upon order creation where payment method used is BACS (Direct bank transfer or COD (Cash on delivery). If an order status for these payment gateways is assigned, then the order status of that order will change to the assigned status and not the default status. For instance, say you have assigned order status for payment gateway as On hold and default status as Processing, then the status of the order executed using BACS payment will automatically change to On hold status instead of Processing. This status is assigned by default to an order which is placed using BACS (Direct bank transfer) payment method. Now when an order is placed using BACS payment method, the status of the newly created order will change to Processing instead of On hold. This is because the default order status is not considered when an order is placed using a BACS payment method and instead the status assigned to the payment method is taken into account. 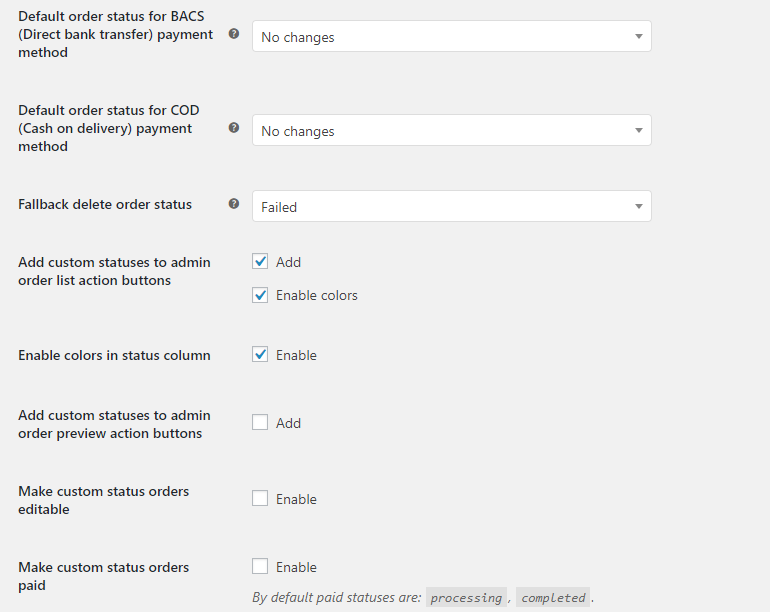 Note – The plugin must allow a custom status to be selected as a default order status for BACS payment method. Hence the drop down should include the list of added custom statuses. 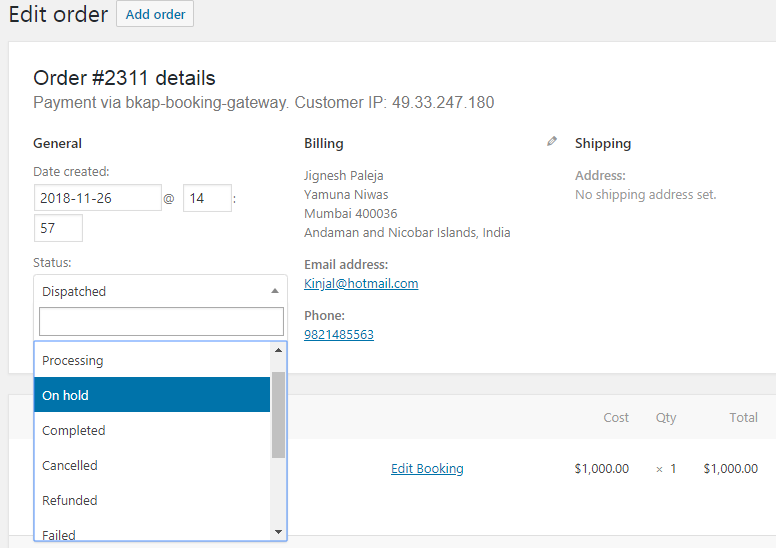 Similar to the above setting, the status selected in this option is by default assigned to the order which is placed using COD (Cash on delivery) payment method. The status selected in this setting will be considered when COD payment method is used, even when a default order status is assigned. For instance, if Default order status is selected as Pending and Default order status for COD payment method is set to On Hold as shown below, the order whose payment is made through COD method will change to On Hold. This is because Default order status for COD payment method will be considered when an order is placed using COD payment method. Note – The plugin must allow to display the custom order statuses in the drop down list so that custom statuses can also be selected as a default order status for this option. The status selected for this option will take effect when a custom order status is deleted. 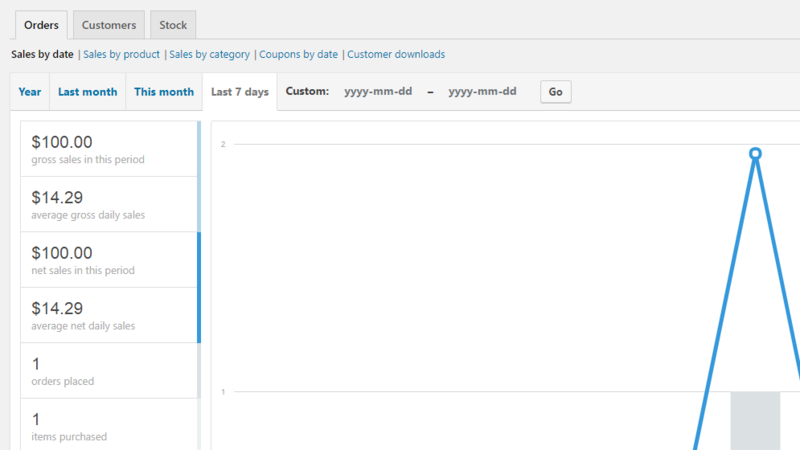 Hence the orders with the deleted custom order status will automatically be assigned the status added in this setting. Consider there are 5 orders which have the statuses set as Finished currently and you decide to delete this custom status with Delete with fallback option. Therefore statuses of those 5 orders will automatically get changed to Processing status because the Fallback delete order status is set to Processing. You can check the Delete section of the previous post for more details. When you create a new custom order status, you are asked to choose an icon code and icon color. This selected icon gets displayed on Admin’s Orders page under the Actions column when Add custom statuses to admin order list action buttons setting is enabled. This icon represents the custom status and when it is clicked, the corresponding order status changes to this custom order status. You need to tick both Add and Enable colors check boxes if you want to add the icon along with the selected color under Actions column. As you can see above, Dispatched status with blue icon is displayed for order whose status is Unfinished and Unfinished status with grey icon is displayed for order with status Dispatched. This is because you can simply just click on these icon buttons to change the statuses from Dispatched to Unfinished and vice versa. Thus bringing ease in updating the status. This option when enabled without enabling the color, the icons will appear in standard grey color. This setting allows you to display custom status icons under Actions column for quick change action of order status. Hence its considered as one of the vital settings of the plugin. 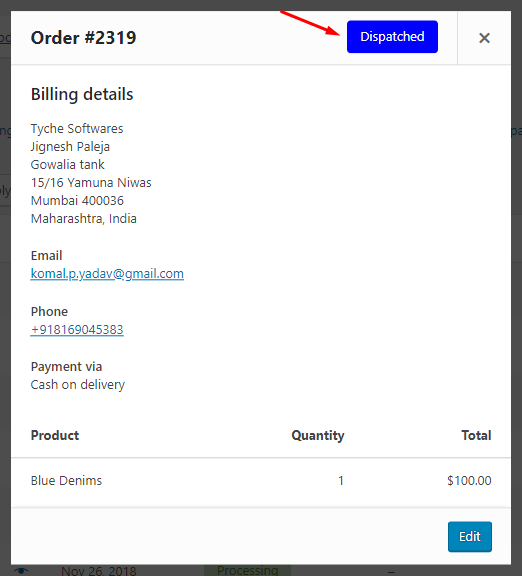 Hence, this option allows the display of custom status on the preview page so that one can get all orders details along with the order status together on the same page. As you can see, Order #2311 has a custom order status Dispatched. When you enable this setting, you can change the custom status of this order by selecting other status from the drop down as shown above. If this option is unchecked, then status of the order with custom order status will not be changed from the Status drop down on the Edit order page. As the name suggests, when Make custom status orders paid option is enabled, the orders with custom order statuses will be considered as Paid orders. At present, statuses like Processing and Completed are considered as Paid. That means when this option is enabled and the order status is changed to custom order status like Unfinished or Dispatched, then that order is considered as a Paid order. This setting is used to reset the general settings to their default values. When you tick the Reset section settings checkbox and click the Save changes button, all the settings will change to the default settings. The advanced settings of Custom Order Status for WooCommerce Pro plugin is discussed in our next post.